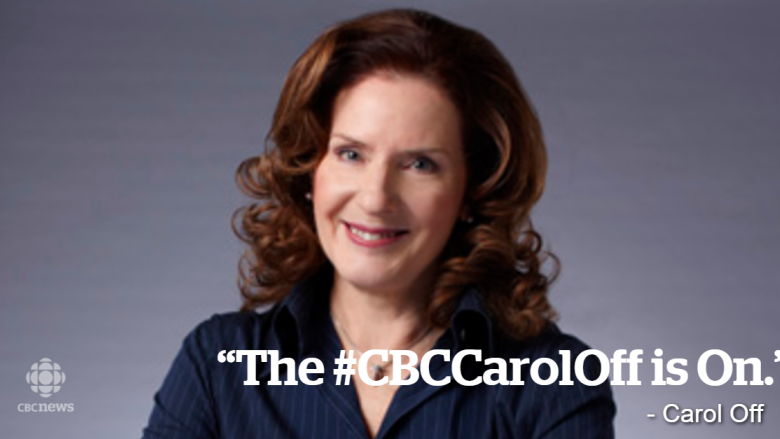 UPDATE: July 31, 2018: CBC Ombudsman Esther Enkin has denied that Carol Off’s inflammatory interview with Israeli MK Michael Oren violated CBC Journalistic Standards and Practices. In any event, CBC’s reply attempts to justify the unjustifiable, tacitly accuses Israel of “unnecessary and disproportionate” force and is wholly unsatisfactory. Another glaring example of CBC bias against Israel. Thank you for your email of May 17 addressed to Esther Enkin, CBC Ombudsman, drawing our attention to an interview with Michael Oren, Deputy Minister in the Israeli Prime Minister’s Office, on the May 16 edition of CBC Radio’s As It Happens. Since I am the program’s executive producer, it is my right and responsibility to respond to your concerns. It’s an opportunity I welcome. You wrote that the interview was “lopsidedly and relentlessly pro-Palestinian”, especially the first question, and doubted the program’s “balance and impartiality”. Let me begin by saying that I sincerely regret that you are disappointed in CBC. However, and I say this with respect, your view of the interview is not one I share, although in retrospect, I agree that we might have phrased the question differently or re-phrased it in a way that better reflected our intent. Allow me to explain what I mean. The context is important here. As you may recall, days before the broadcast, on Monday, May 14, some 35,000 thousand Palestinians were said to have gathered near the fence separating Gaza from Israel in the culmination of what the organizers called the “Great March of Return.” Tensions were heightened that day as the protests coincided with celebrations in Jerusalem marking the relocation of the U.S. Embassy there. The protests began peacefully, but soon turned bloody. The Palestinians set tires alight, threw rocks, Molotov cocktails and stormed the fence, the Israeli government said, intent on mayhem and murder in Israel. Israel said in the face of such violence, it had no choice but to defend itself vigorously. Video images showed army snipers lying on the top of an earthen berm shooting live ammunition toward crowds of Gazans, including women and children. The IDF said it was shooting at instigators and defending Israel in gravely threatening circumstances. Casualties mounted by the hour. While Israel said it was taking the only action it could to defend the country, the optics were disturbing. By nightfall, one Israeli soldier had been wounded; no one had made it over the fence. But some 60 Palestinians were reported to have been killed and more than 2,700 wounded, many by gunfire. Maybe the dead were largely members of Hamas as one ranking Hamas official said. Maybe Hamas had pushed women and children forward as the IDF reported. But to many watching the conflict unfold, the high number of casualties seemed unnecessary and disproportionate, prompting condemnation from around the world. At the end of day, Israel had beaten back the Palestinians, but in the eyes of many, lost the public relations war. And that was the issue we wanted to put to Mr. Oren. Ms. Off began the interview by asking him if there was a limit to the number of Palestinians Israel would shoot. In other words, she was asking if there was a point at which the Israeli government would decide the cost of defending the fence in the way it had was too high. The question cuts to the intersection of reality and perception. It suggests a dilemma seen repeatedly in conflicts in the Middle East and around the world: When does the cost of winning become too high? That was the point of Ms. Off’s question. At what point would Israel find the cost here too high. It was the question many Canadians were asking. But in retrospect, I think we could have rephrased it or given it added context to make our intention in asking it clearer. Nevertheless, Mr. Oren is the right person to ask. He is a respected Member of the Knesset, a former ambassador to the United States, an author, historian and prominent member of the Israeli government. And that’s why we wanted to talk to him. He is articulate, outspoken, a skilled debater and a staunch defender of the Netanyahu government and might reasonably be expected to explain and, if needed, defend the government’s actions. And, indeed, he put the government’s case skillfully and in unmistakable language. Ms. Off or any other CBC journalist would fail in her responsibility if she simply offered Mr. Oren a platform to express his views. It is also an interviewer’s responsibility to test those views, to question assumptions, to challenge, to point out there are other views. doing that does not constitute a “relentlessly pro-Palestinian” bias. I should emphasize here that the interview you wrote to us about is far from the only interview we did about the six-week long “Great March of Return” protest. You heard the interview with Mr. Oren. If you were listening two days later on May 18, you would have heard an interview with Hamas official Ahmed Yousef, an advisor to Hamas leader Ismail Haniyeh, in which Ms. Off tested and challenged his views in much the same manner she did in the interview with Mr. Oren. Thank you again for your email. I hope my reply has reassured you of the continuing integrity of our program. It is also my responsibility to tell you that if you’re not satisfied with this response, you may ask for the matter to be reviewed by the CBC Ombudsman. The Office of the Ombudsman is responsible for evaluation program compliance with CBC’s journalistic policies and may be reached by telephone at 416-205-2978, or by mail at Box 500, Terminal A, Toronto, Ontario M5W 1E6, or by fax at (416) 205-2825, or by e-mail at ombudsman@cbc.ca. UPDATE: May 21, 2018. CBC As It Happens and Anchor Carol Off appear to have tried to walk back their controversial anti-Israel programming by featuring a segment on May 18 with Hamas member Ahmed Yousef. Read our full alert here. UPDATE: May 18, 2018: (12:02pm EST). True to form, two days after conducting a hostile and combative interview with former Israeli Ambassador to the U.S. Michael, Oren, CBC As It Happens and Anchor Carol Off doubled down yesterday evening (May 17) by giving a platform to Avner Gvaryahu, the Executive Director of the anti-Israel and radical organization known as “Breaking the Silence” to condemn Israel. Read our full alert here. 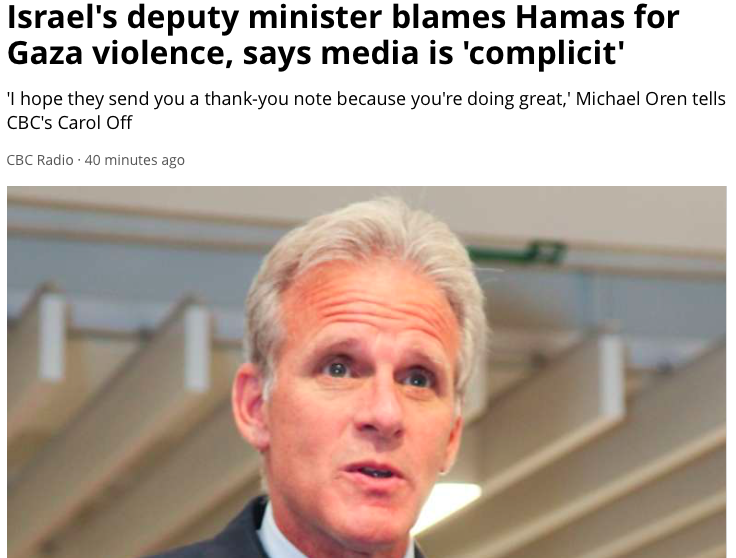 Now absent from the headline is Oren’s blaming Hamas for Gaza violence and the media (including CBC’s Carol Off) for complicity. In its place, CBC appropriating a partial quote of Oren’s saying that “Israel had ‘no choice’ but to shoot Palestinians”. His expanded quote mentions that the majority of the casualties were terror operatives/combatants. You can listen to the interview in full by clicking here or immediately below. A CBC transcript of the interview is available on the CBC’s Website. Carol Off: How do you think that looked to the world yesterday when all those people were shot dead at their border? Michael Oren: I think it looked to the world the way Hamas wanted it to look to the world the world.You’re doing just what they want you to.Even your line of questioning is just what Hamas wants.And, frankly, Carol you’re complicit in further damage and even deaths of Palestinian kids. Because Hamas is going to conclude from listening to this interview that it works.And people like you in the media will turn around and say it’s great, and Hamas are going to wake up tomorrow morning and do it again.I hope you’re proud of it. Carol Off: What is it you were defending yourself against yesterday? Why did you shoot those people? Michael Oren: Their goal was to break through and kill. Now you spin it in a different way, but it wasn’t. The way you spin it, it’s just the way Hamas wants it.I hope they send you a thank-you note because you’re doing great. Carol Off: All of them? Palestinians are all terrorists? Michael Oren: I think you have to ask yourself two very important questions. Why do you not care when Arabs kill Arabs. Only when Jews are forced to kill to defend themselves?And why do you — you — play the role of conspirator with Hamas?You are an abettor of terrorism. In sharp contrast, prior to this interview, Carol Off conducted a sympathetic interview with anti-Israel detractor Tarek Loubani, a Palestinian-Canadian doctor who claims he was shot on Monday by Israeli snipers and that other medical practitioners were “summarily executed”. Off asked Loubani if Israel intentionally targeted medical practitioners. It was noticeable to any discerning listeners that Off struck a sympathetic tone with Loubani and a combative tone with Oren. Untold by Carol Off is that Hamas officials say that 50 of the 62 Gazans killed in border violence were its own members. Israel previously said that at least 24 Gazans reported killed at the border on May 14 were terrorists. Hamas and Islamic Jihad published photos acknowledging that 13 of their operatives died in Monday’s violence. Ms. Off’s interviews were unfair, lacked balance and context and stood in violation of the CBC’s Journalistic Standards and Practices. This is a classic and an egregious example of media bias against Israel which was carried out on our public broadcaster’s national airwaves. HRC has filed an official complaint with CBC and we strongly encourage you to communicate your concerns too. To send a complaint to CBC News, please send emails to CBC Editor-in-Chief Jennifer McGuire at: Jennifer.McGuire@cbc.ca. 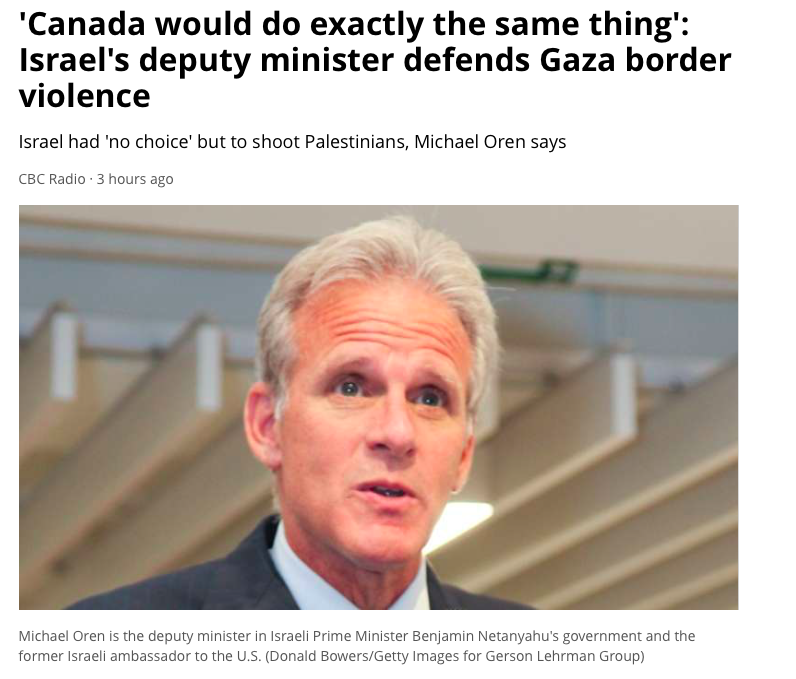 Please refer to CBC Anchor Carol Off’s May 15 As It Happens interview with former Israeli Ambassador to the U.S. Michael Oren and condemn her one-sided and biased interviews.